This beautifully restored and professionally decorated residence is located within the walled city, the historic center of Montepulciano, an important hill town in southern Tuscany. Situated on a small lane just off the main commercial street of the town, 'the Corso,' it offers ready access to the cultural life of the town (see our website for details http://www3.sympatico.ca/amcquillan/index.htm), restaurants, coffee bars, shops and the wine bars, tasting rooms and cellars where you can sample the famous wines of Montepulciano, yet the apartment is so quite that an alarm clock will be needed if you don't want to sleep away the morning. At the foot of the lane is a small plaza overlooking the medieval wall of the town with a breathtaking panoramic view of vineyard-covered hillsides, clusters of farmhouses and the Lake of Chiusi in the near distance, Lake Trasimino and the town of Cortona in the middle-distance and the spectacular Appenine Mountains beyond. The precise age of the original house is not known but the cellar contains the town's only remaining ceramics kiln and certainly predates the 17th century addition that is now a separate residence for the owners. Although completely renovated, the residence retains its original character - hand-hewn chestnut beams, handmade terra-cotta floors, travertine marble door frames set in thick stone walls with panelled wood doors and hand forged iron hardware. Even the copper and wrought iron light fixtures were made by a local craftsman. The bathrooms and kitchen are thoroughly modern and equipped to meet the expectations of discriminating visitors. There is also a central heating system and a working fireplace for the comfort and pleasure of winter visitors. A washing machine is located inside the unit. A drying rack is provided, but not an electric dryer. The living room comfortably seats five, a 3 seat sofa and two club chairs. and there are side / coffee tables, a flat screen TV and a fireplace. Beautiful apartment with lots of marble and antique furnishings. Stunning view of Tuscan hills. Although a treck up the stairs from the parking area with luggage, this apartment is in a perfect location with a stunning view just steps away from the entrance. It is furnished with beautiful marble and tasteful antiques. Montepulciano was the perfect town to make our home base in Tuscany. We found ourselves looking forward to coming back to our montepulciano apartment at the end of every day. Beautiful place and Royce was an amazing host. If you are lucky enough to book this attractive multi-level apartment in the unforgettable town of Montepulciano, you will have an experience to remember. There were 3 of us -- myself and husband and our adult daughter. The beds were very comfortable, the kitchen was charming, and we could completely relax there after our daily travels in the countryside or walks around the town. The owner was completely responsive and helpful when we were booking and made sure we had everything we needed when we arrived. We found ourselves almost every evening sitting on a bench on the outside terrace with a glass of wine to watch the sunsets. The location of the accommodation couldn't have been more convenient, with everything we needed within a few steps. Although there are many very nice accommodations in the surrounding countryside, we felt we wouldn't have enjoyed our 8 days in Tuscany as much if we hadn't been able to stay here. The apartment was the perfect accommodations for two couples visiting the Tuscan region. We were a short walk to cafes and restaurants. We would start each morning at the coffee cafe and sit on the balcony overlooking the countryside. The town as well as the apartment were enchanting. The terrace outside the apartment was a lovely place to enjoy a bottle of wine and just relax while enjoying the views. We appreciated the kitchen when we took the time to use it, but mostly enjoyed what the town had to offer. Thanks to Royce and Aidan for renting out the apartment to us. We hope to return. 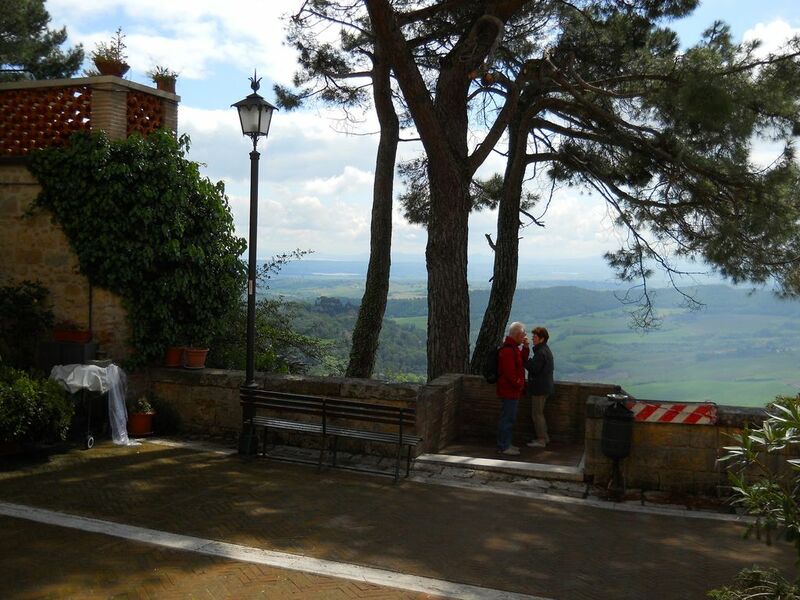 My husband and I, along with another couple, just returned from a wonderful week in this apartment in Montepulciano. This is the second time my husband and I have stayed in this apt, and we found it just as comfortable and well appointed as the last time. Perfect for two couples. There is quick access to a beautiful piazza that we would begin each day at with our coffee and end each day at with our wine and snacks before deciding which wonderful restaurant we'd go to in Montepulciano. The view from this terrace, piazza, is amazing!! It's like you can see forever. Beautiful! Royce was very easy to deal with and also provided a lot of helpful information. A perfect apartment in a perfect place!! Thank you again Royce. Highlight of our three week trip!! This place is situated in a perfect spot in Montepulciano. We enjoyed and used the viewing area quite a bit. We watched sunrise with our coffee and had relaxing evenings with our wine out there. The owners are very helpful and give plenty of information for the surrounding area to enjoy. Parking in the lot below the stairs is the easiest if you are able to do stairs, which you will need to be able to do in the unit as well. The unit has everything you would need for a nice stay in this beautiful hill top town. Loved it!! Walking wine tours are unique to Montepulciano as the vineyards all have in-town tasting rooms, some in ancient wine cellars or you can visit the vineyards in the countryside. In-town tastings are the greatest way to sample wines as no designated driver is required. Don't miss the international music festival in July and the chamber music concerts and solo performances presented virtually year round thanks to the European Academy of Music, which is located in town. The venues for the concerts are spectacular, some take place in the town square, others in an 18th century opera house or one of the renaissance churches or in one of the great halls that are found on the main floor of the grand houses built by the noble families. Some of these have become public buildings but many are still private residences not normally open to the public. There is a Christmas Market that runs from early December through January 6th, the traditional day for exchanging gifts in Italy. There is a month long artisans fair and other programs throughout the summer and on special weekends and holidays in other seasons. The final week of august is the town's major festival, parades, bands, medieval pageantry and nightly outdoors 'BBQ' like dinners sponsored by each of the neighbourhoods but all are welcome to participate. Many local artist and artisans open their studios and exhibit their works for sale in galleries throughout the town.